Spirit of Place | Artsite Galleries | Sydney | 06 - 28 April 2019 | Maruku Arts | Warburton Arts Project | Elizabeth Holland | Lalla West | Madeline Jackson | Christine West | Debra West | Nola Hunt | Olive Lawson | Betty West. Spirit of Place | Artsite Galleries | Sydney | 06 - 28 April 2019 | Warburton Arts Project | Elizabeth Holland | Lalla West | Madeline Jackson | Christine West | Debra West | Nola Hunt | Olive Lawson | Betty West | Maruku Arts. Wati Kutjarra, or the Two Men is an extremely important Law story. Here the men are shown resting, gathering wild food and conducting ceremonies with other men in country to the north of Warburton Ranges. The short curling shapes are natural features of the landscape, and the two men can be seen resting within their respective bow shelters at two separate sites. The Minyma or women, have gathered near Irruntju east of Warburton to conduct love ceremonies for finding of good husbands. The women and their ceremonies are in the central, circular shape. From here the power of their love magic reaches out, locating and drawing the men who are shown as the discs around the edge of the painting. Christine West: Minyma Kutjarra - Two Women (WAPCS020-12),Acrylic on canvas, 90x101cm. 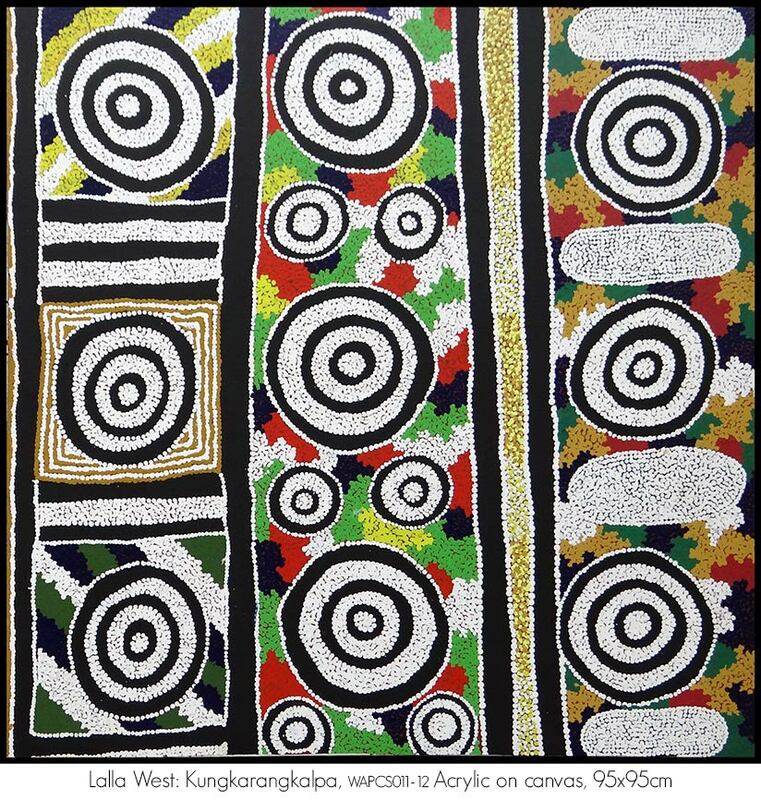 Minyma Kutjarra are sitting at Kurlianpurru in the artist´s father´s country making mangurri or headrings, used by Aboriginal women to balance their bowls on their heads for travelling. As they made each Mangurri they threw them out into the landscape around them, for people to use. The concentric circles show both the head rings and the sacred site of Kurlianpurru at the centre of the painting. 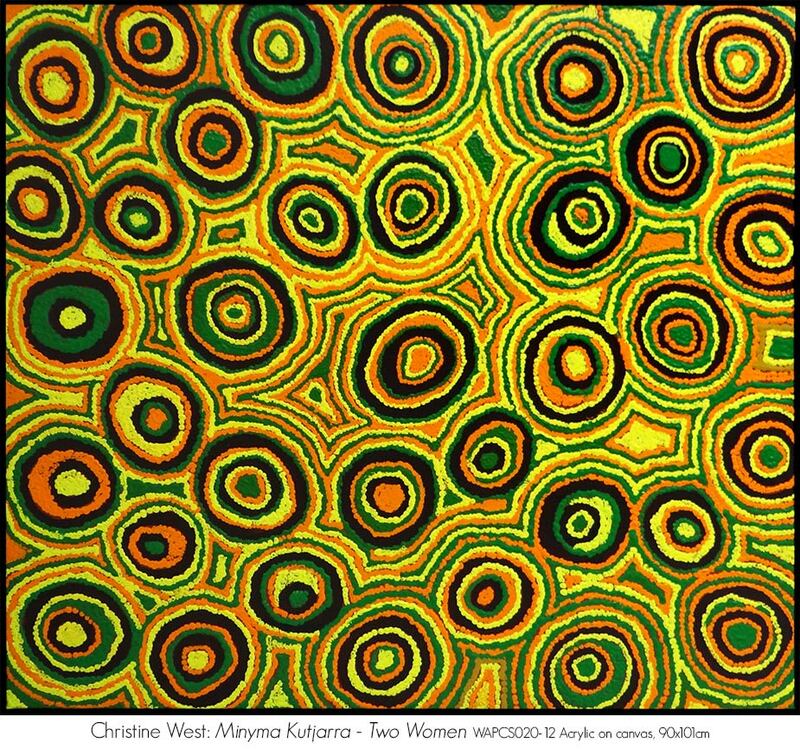 Christine West: Minyma Kutjarra - Two Women (WAPCS019-13), Acrylic on canvas, 95x95cm. 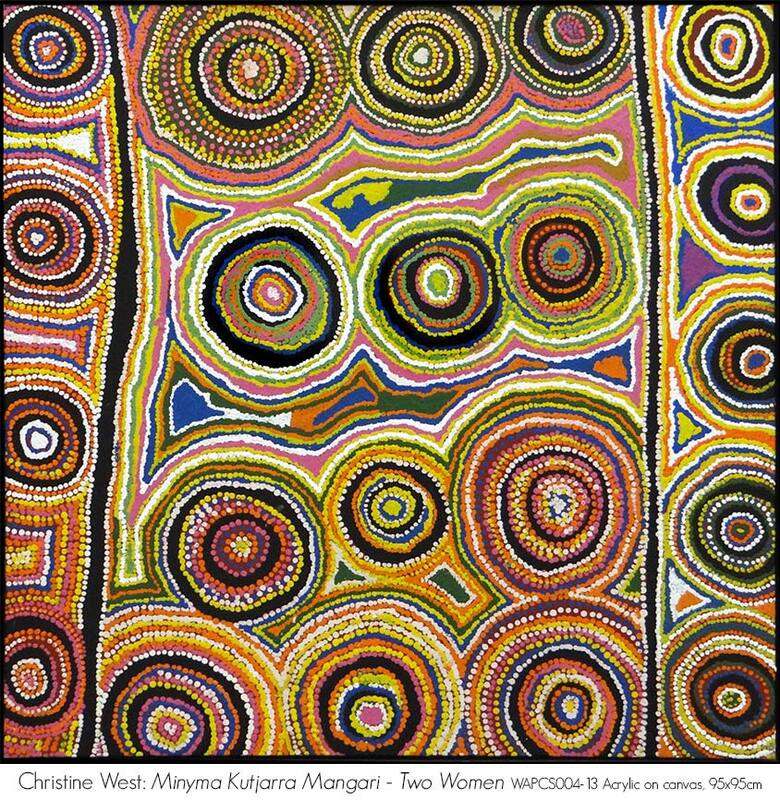 Minyma Kutjarra are resting in country near Wingellina and making traditional skirts of spun hair. The two sisters were homesick for their birth country near Cundelee a long way to the south. They were consoling each other as they worked before moving on towards Docker River. The hair skirts can be seen in the undulating grey and black forms lying on the landscape around them. 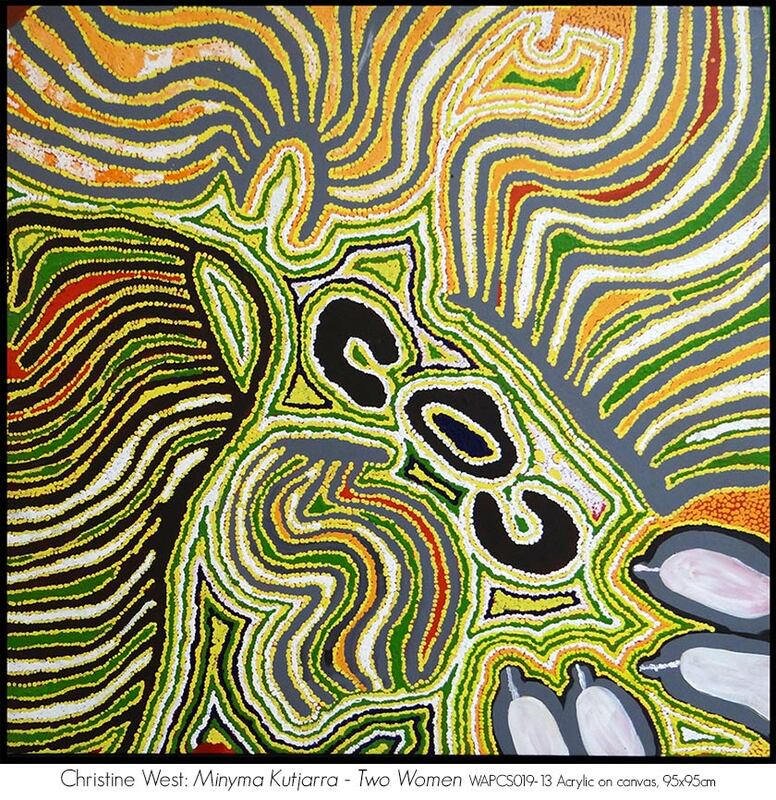 Christine West: Wati Kutjarra - Two Men (WAPCS006-12), Acrylic on canvas, 97x80cm. This is part of the important Wati Kutjarra, or Two Men Tjukurpa at a site northeast of the Warburton Ranges on their path across the Central and Western Deserts. The men are throwing sacred boomerangs near Kunnapurrul Waterhole when one accidently hit and killed a woman, causing them profound regret. Concentric circles show sacred places on their travels and the ‘L’ shaped forms are the boomerangs. The men are shown as two ‘U’ shaped forms partly enclosed by a black perimeter, which is a desert shelter of branches and trees. 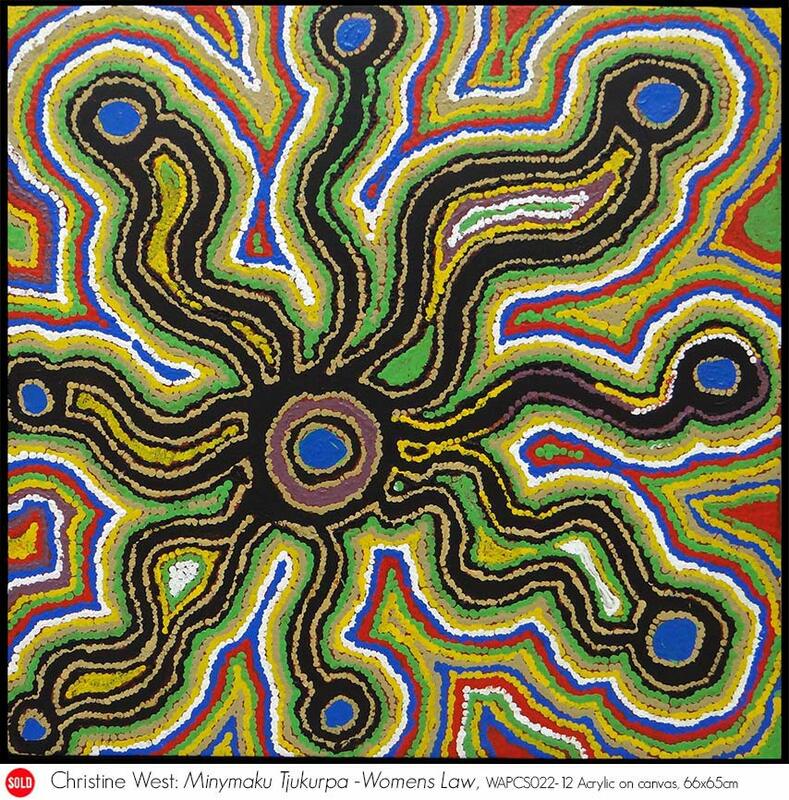 Christine West: Minyma Kutjarra Mangari - Two Women (WAPCS004-13),Acrylic on canvas, 95x95cm. 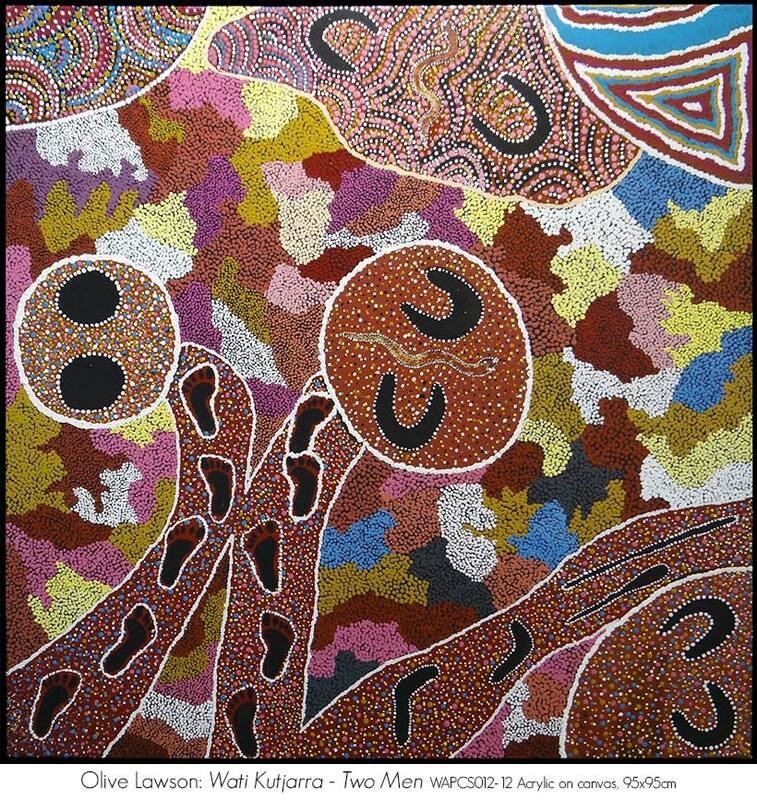 The Minyma Kutjarra, travelled the artists´ traditional lands during the creation period, forming landscape and leaving behind information still used today about important rituals. 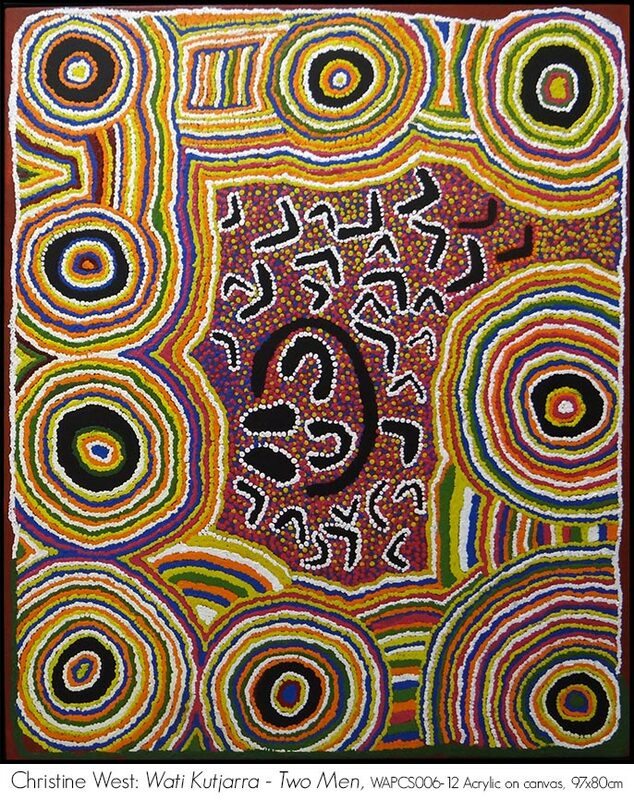 In this painting, concentric circles show mangurri or headrings used by the women to balance collecting bowls on their heads when travelling. The Minyma Kutjarra left them scattered around the country as they crossed to the southeast of the Warburton Ranges. Where they came to rest are sacred sites in an important songline linking women across the Central and Western Deserts. Debra West: Kungkarrangkalpa- Seven Sisters Story (WAPCS025-13), Acrylic on canvas, 150x153cm. The Kungkarrankalpa are arriving at Kulyurru in the Great Victorian Desert. Throughout their long journey the old magician Yula has been pursuing them and this part of the story, has fastened a magical silver snake in the sky above the sisters. Thinking its food, they follow and see where it falls to earth and it goes down a small mouse hole. The sisters dig the snake up and eat it but immediately become sick and collapse on the ground. This is the opportunity for the old magician to surge in from the sand hill country, creating a gorge at Kulyurru. Debra West: Kungkarrangkalpa- Seven Sisters Story (WAPCS005-12), Acrylic on canvas, 94x119cm. This is a map of the Kungkarangkalpa song line, each location a verse in the sacred epic of their creation story across the Western Desert. It shows sites to the north of Warburton with the sisters gathered in the centre to conduct ceremonies. The lines of linked circles show some of the places they visited, giving ceremonies, law and creating the natural features of the landscape. 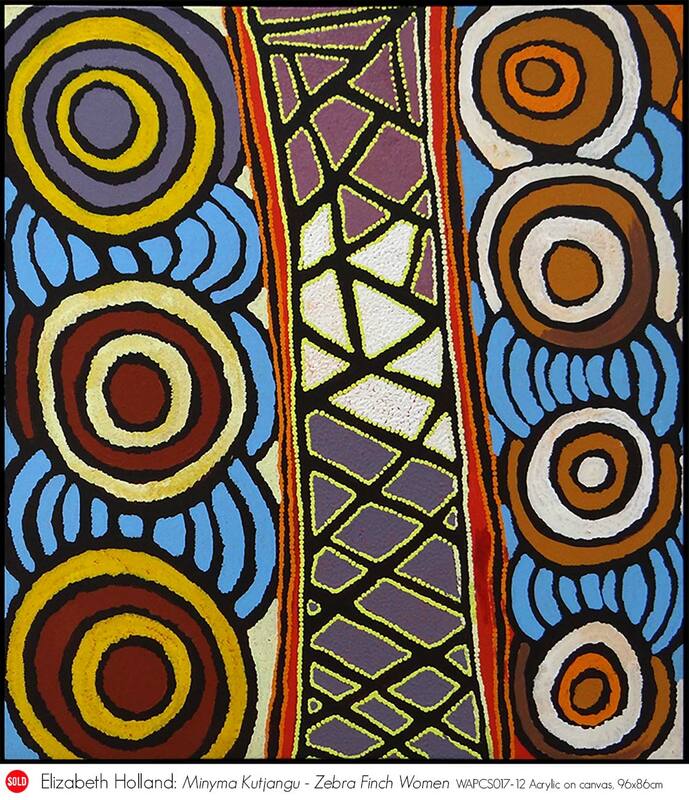 Elizabeth Holland: Wati Kutjarra - Two Men (WAPCS026-13), Acrylic on canvas, 88x143cm. Wati Kutjarra are travelling across the country to the east of Warburton dancing ceremonies and creating the natural features of the landscape. At Tilitjarra the two men arrived and plunged their spears into the rock creating the water hole. As they rested they pulled the knots and tangles out of their beards and released these into the wind. As the knots blew across the landscape they created great forests of trees which can be seen to the south of the Talitjarra. This is the birthplace of the artist. 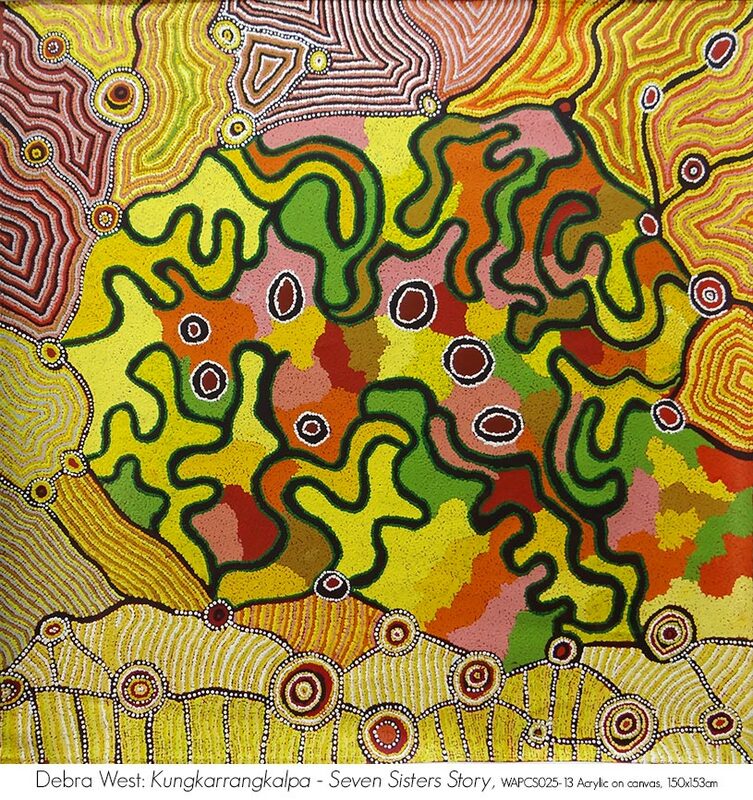 The water holes are the small yellow linear shapes in the centre of the painting with the two men approaching as yellow discs in a corner. 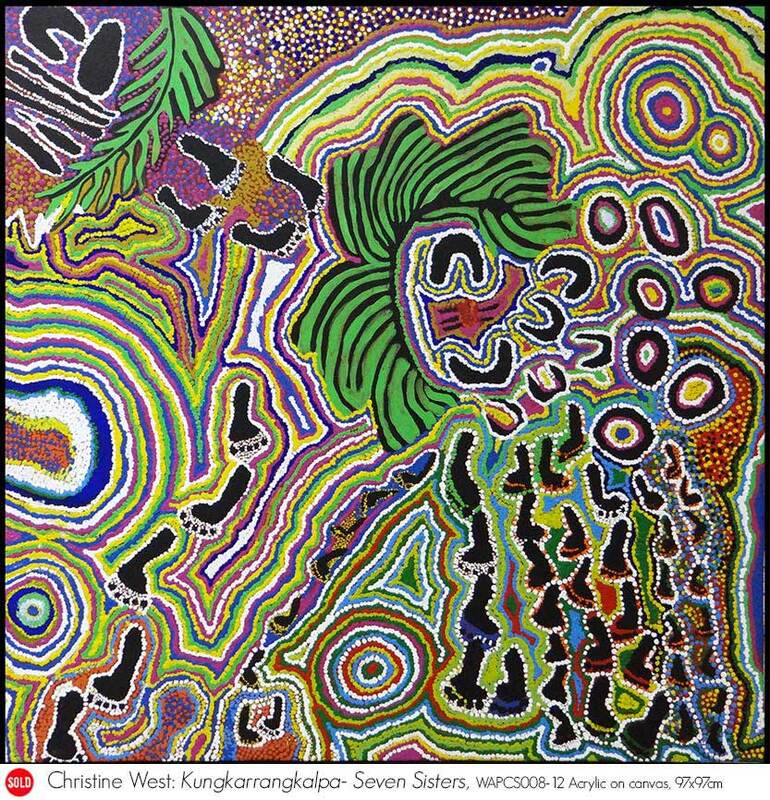 One side of the painting lists the sacred sites in Wati Kutjarra songline. 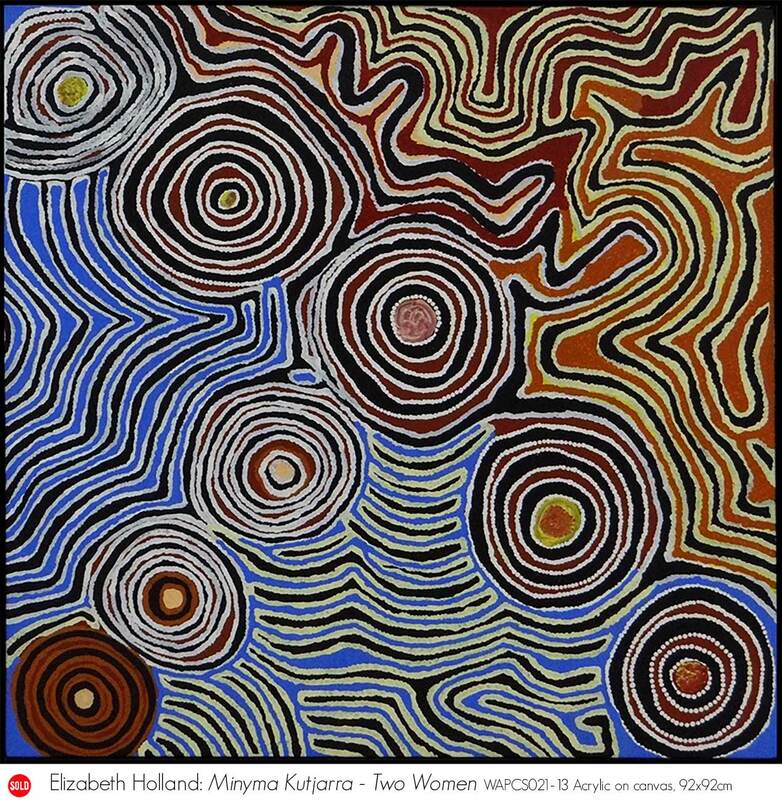 Elizabeth Holland: Minyma Kutjarra - Two Women (WAPCS021-13), Acrylic on canvas, 92x92cm. Minyma Kutjarra are travelling across the country just to the south of Warburton Ranges, making Mangurri or headrings and leaving them in the landscape for people to use. They made two especially large head rings, now seen as two low but prominent hills. The concentric circles are the head rings made by the sisters as they travelled, and the surrounding linear patterns are sandhills and gravel ridge country in the desert. Elizabeth Holland: Minyma Kutjangu - Zebra Finch Women (WAPCS017-12), Acrylic on canvas, 96x86cm. Minyma Kutjangu, the Zebra Finch Women are near Wanarn, sitting down together in the landscape. As they are resting Wati Niri Niri or Beetle Man sneaks into camp and begins eating the bark of the trees, making a buzzing humming sound. 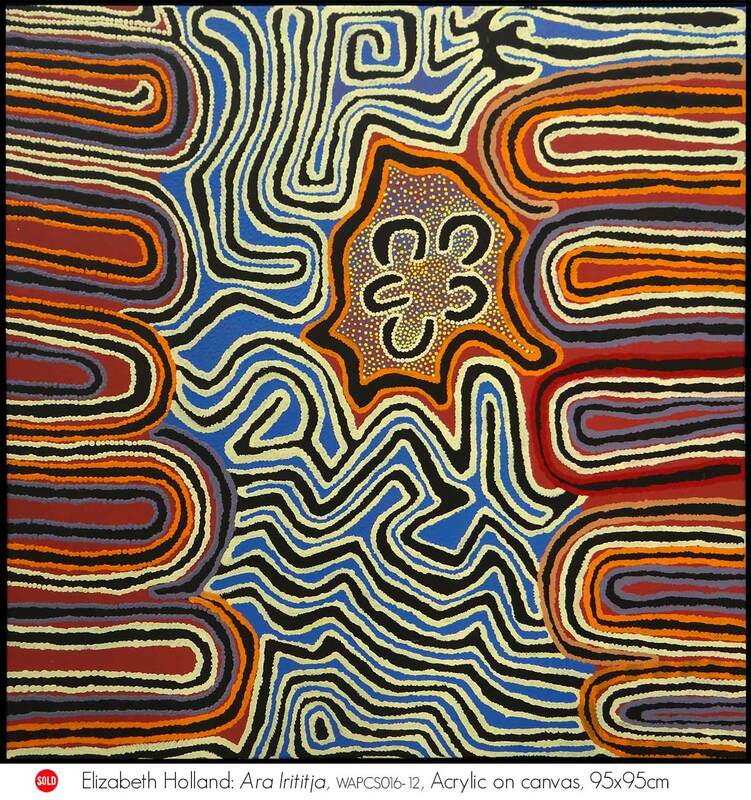 The angular motifs running down the centre of the painting represents the marks left by the Niri Niri beetle as it ate the bark of the trees. The resting Zebra Finch women are brightly striped circles. Elizabeth Holland: Ara Irititja (WAPCS016-12), Acrylic on canvas, 95x95cm. The artist painted her childhood memories as she lived a traditional life in country around Warburton. She shows her small family group in a landscape of sandhills covered with trees and rocky ridges. These recollections of her nomadic life as a child and young woman governed by clarity formed by the centuries of tradition are some of her happiest memories. Elizabeth Holland: Kungkarrangkalpa - Seven Sisters Story (WAPCS015-10) Acrylic on canvas, 130x120cm. This painting shows an event in song line of the Seven Sisters as they travelled across country in the Western Desert. The sisters are approaching a place called Kunyangurra in two separate groups, collecting food supplies as they go. On arrival, they all plunged the digging sticks into the flat rock plain, thereby creating deep water holes painted here as circles, in all the nine rocks at Kunyangurra. Lalla West: Kungkarangkalpa (WAPCS011-12), Acrylic on canvas, 95x95cm. This painting shows the designs painted on the breasts of women dancing in the Seven Sisters song line ceremonies, specifically those related to sacred places at Kurrualya. The broad white oval shapes show the mythic ceremonial grounds created by the Sisters as they moved across the country. 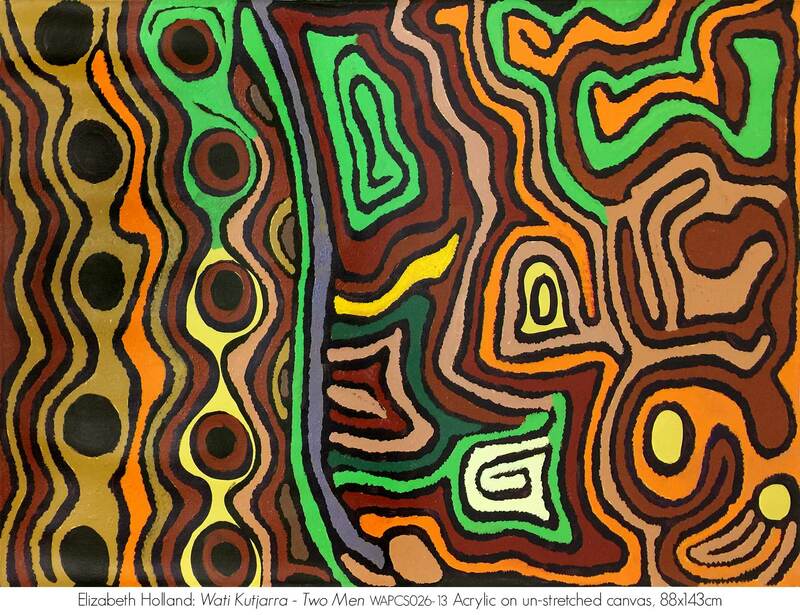 The Ngaanyatjarra word ‘Kurrualya’ means, ‘wide open eye’. Christine West: Kungkarrangkalpa- Seven Sisters (WAPCS008-12), Acrylic on canvas, 97x97cm. 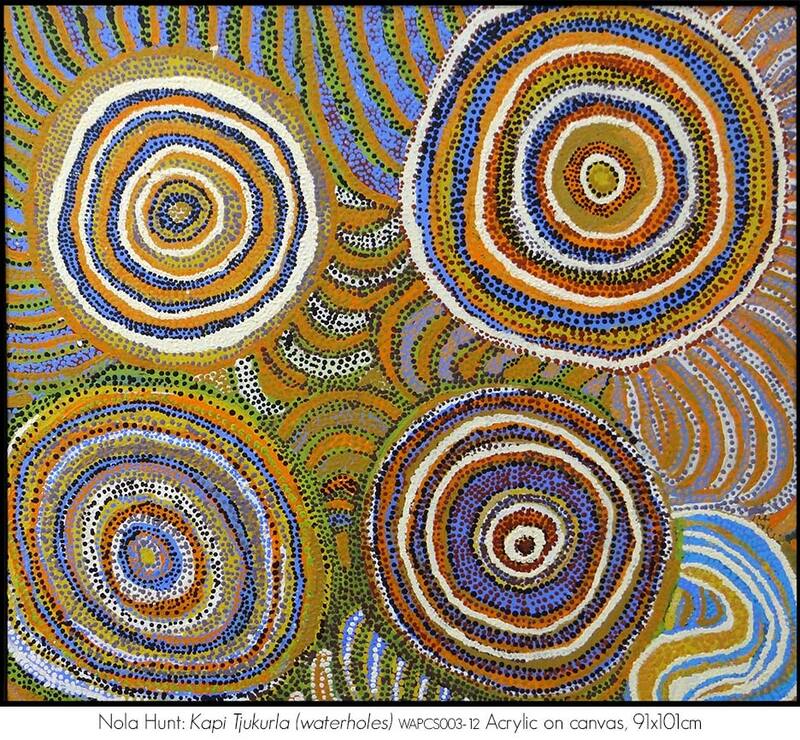 This painting shows a part of the Kungkarrangkalpa story that passes to the west of Warburton in country called Pirakatja. The sisters are travelling across sandhill and red gravel ridge country, pursued by the old magician Yula. He can be seen as the ‘C’ shaped motif in one corner, advancing on the Sisters and causing them to flee. 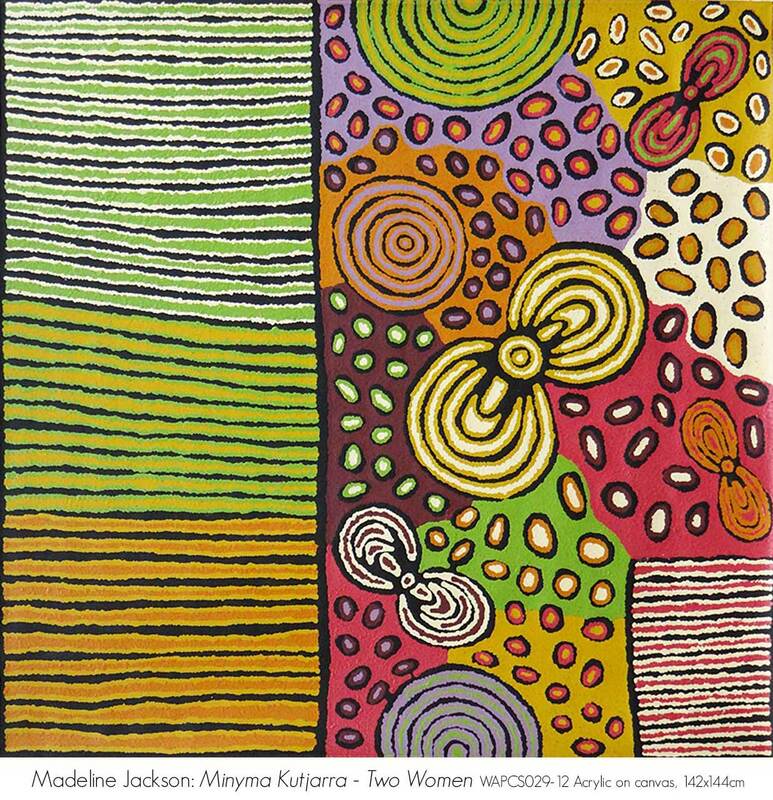 Madeline Jackson: Minyma Kutjarra - Two Women (WAPCS029-12), Acrylic on canvas, 142x144cm. The Minyma Kutjarra are travelling north in the country near Tjukurla. conducting ceremonies and scattering head rings they make for people to use. The elliptical forms with a circle at the centre of one section shows the women in ceremony. 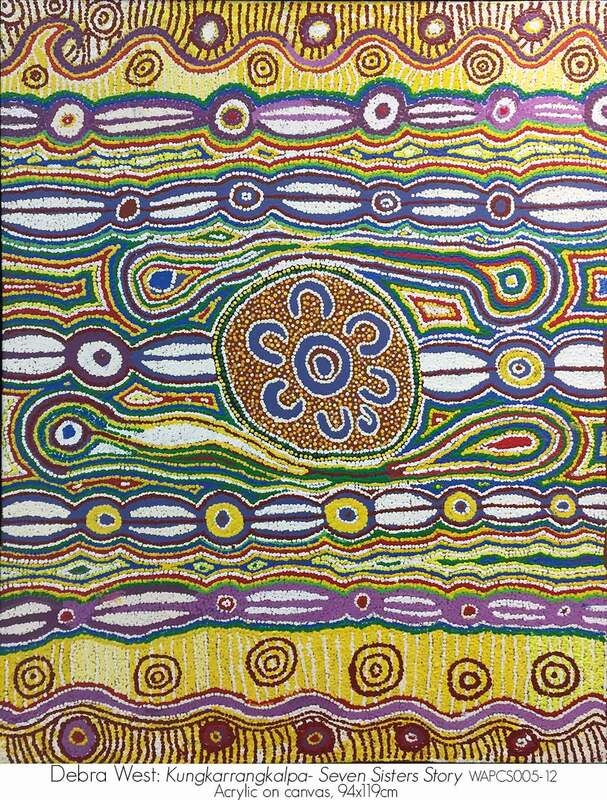 Larger concentric circles show sacred sites on their songline, while the headrings are the smaller coloured discs scattered across the landscape. The linear panel of the other section of the painting shows the many lines of sandhills the women crossed as they journeyed. 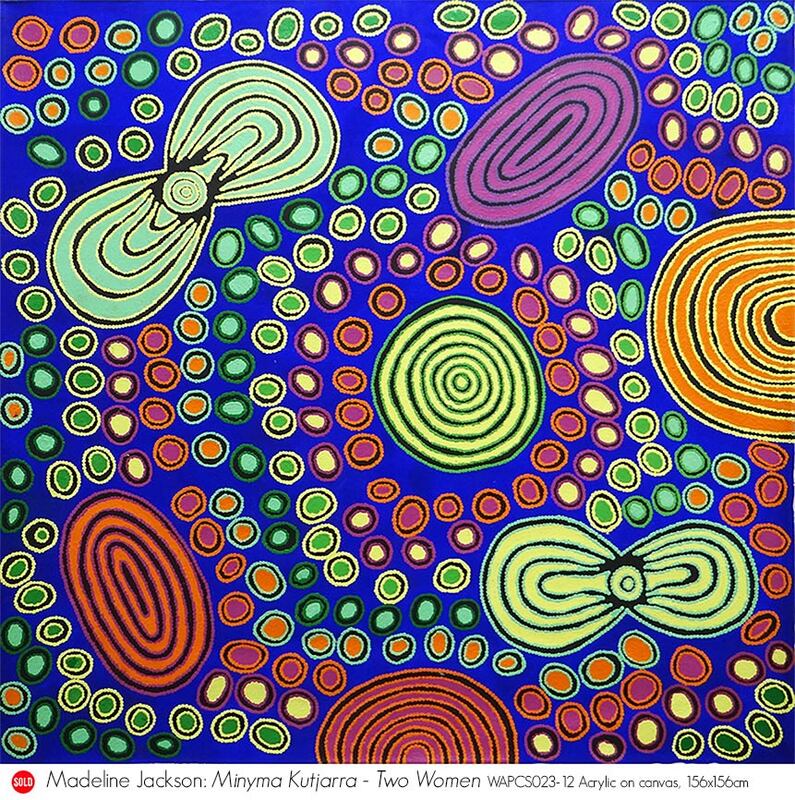 Madeline Jackson: Minyma Kutjarra - Two Women (WAPCS023-12), Acrylic on canvas, 156x156cm. Here are the rock holes and sites where Minyma Kutjarra, the Two Women conducted ceremonies. During this time they made mangurri head rings used by women to balance collecting bowls on their heads. They then cast them into the landscape for other women to use. The elliptical forms with a circle at the centre are the women in ceremony while the other circles are sacred sites on their songline. The headrings are the smaller discs, scattered colour across the landscape. 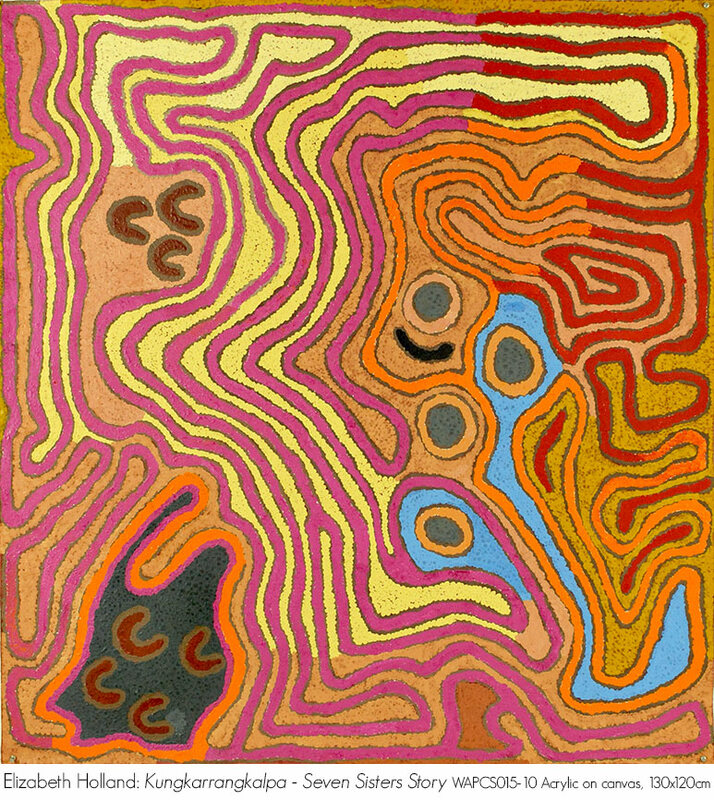 Nola Hunt: Kapi Tjukurla (waterholes) (WAPCS003-12), Acrylic on canvas, 91x101cm. These are the sacred Kapi Tjukurla or waterholes Kunnapurrul, Mamine, Winljurru and Kulpalytjarra in the artist´s father´s country to the North of the Warburton Ranges. They are on the sacred songline of Wati Kutjarra, the Two Men, as they travelled across country, creating the natural features of the landscape, giving sacred law and ceremonies for the ongoing spiritual maintenance of desert life. Curved lines show sandhills covered with vegetation and the circles show the vegetation and the water places. 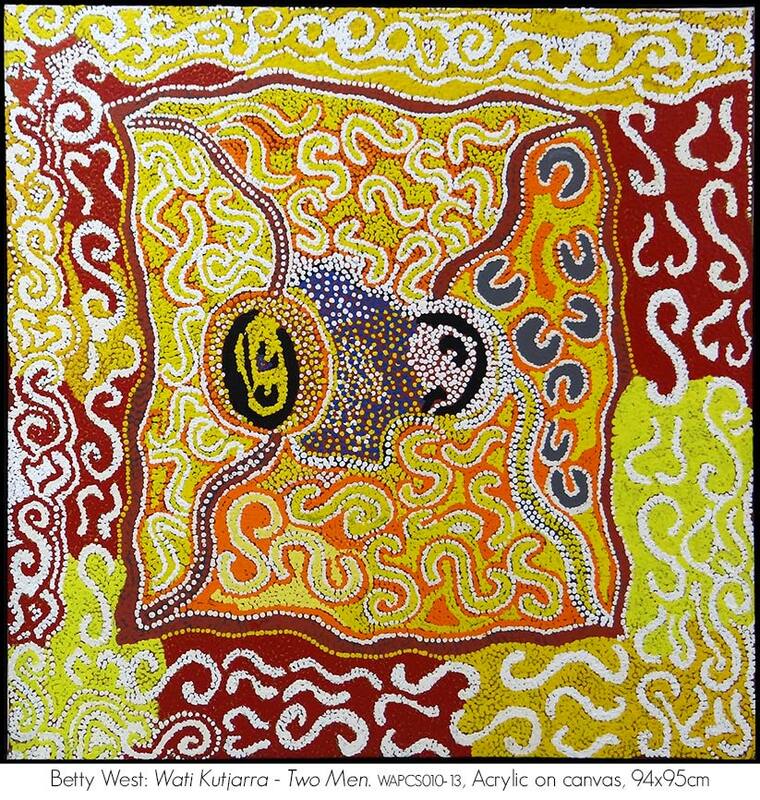 Olive Lawson: Wati Kutjarra - Two Men (WAPCS012-12), Acrylic on canvas, 95x95cm. Wati Kutjarra, or the Two Men, is an extremely important Law story. Here they are travelling across country to the east of Warburton. At a certain point, they stopped and drove their spears into the ground to create large rock holes. From here they travelled further east, eventually arriving at another important sacred place known as Kalkakutjarra. 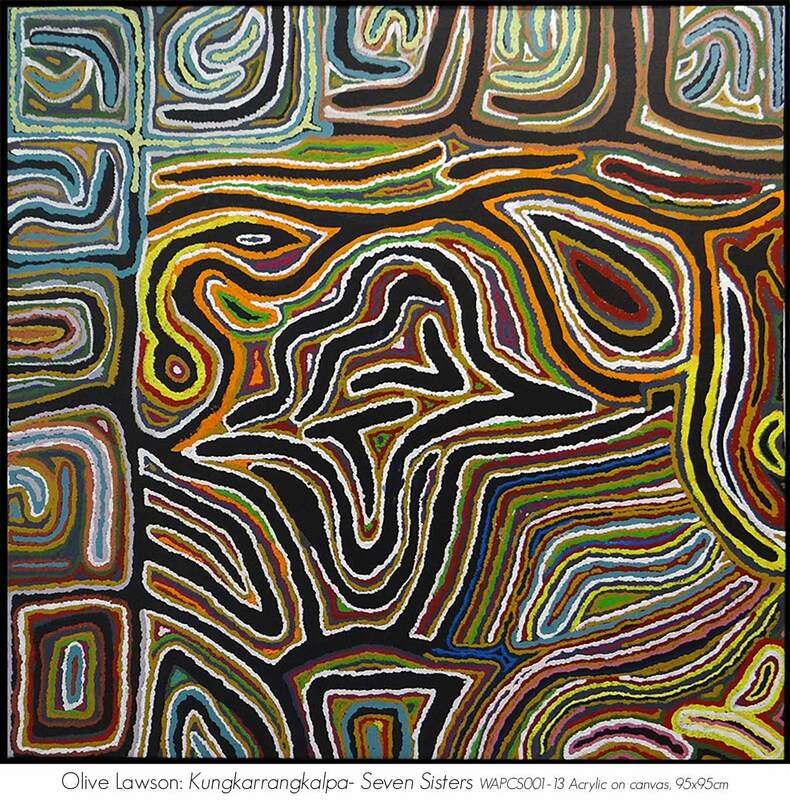 Olive Lawson: Kungkarrangkalpa- Seven Sisters (WAPCS001-13), Acrylic on canvas, 95x95cm. The Kunkarrankalpa travelled the lakes and surrounding countryside in the artist’s mothers country, near Warburton. The black shapes show the lakes between the sandhills and gravel ridges. This country to the south of the Warburton Ranges is crossed back and forth with the sacred trail of the Seven Sisters.